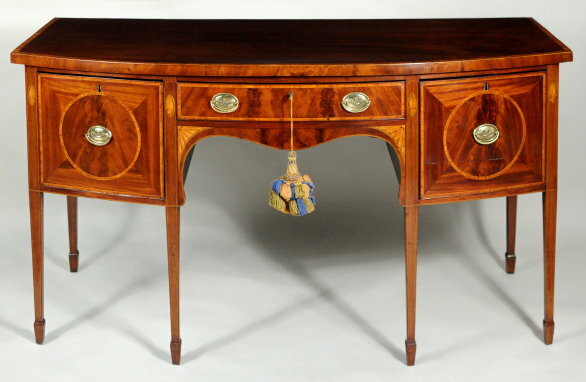 Wonderful hepplewhite inlaid mahogany bowed front sideboard, with figured mahogany top with bowed crossbanded front, above a case with one long central drawer and two flanking end drawers, all with richly figured mahogany veneers and inlaid stringing, the legs with conch inlaid stiles and string inlays, ending in spade feet. Superb mellow brown color. England, circa 1790-1800. 69" long, 28" deep, 37" high.